When I learned that Nina Paleologos, MD, was coming to Rush University Medical Center to join the Coleman Foundation Comprehensive Brain and Spine Tumor Clinic, I felt a jumble of emotions. Dr. P, as a lot of people call her, will always be inextricably linked to one of the worst periods of my life — the 20 months during which my beloved stepmom, Elaine, was diagnosed with, treated for and succumbed to brain cancer. Dr. Paleologos was Elaine’s neuro-oncologist, so the only times I ever saw here were during Elaine’s appointments, and it’s impossible to separate my grief from the doctor who delivered the news that caused that grief. But at the same time, I’m thrilled she’s here. She provided outstanding care for Elaine — not just the clinical trial that kept the tumor from growing back immediately, as aggressive brain tumors will do if left untreated, but the empathy and honesty she showed our family. One thing I’ve learned working at Rush for the past 13 years is that the term “good outcome” doesn’t always mean the person recovers fully and goes on to live a long and happy life. For brain cancer, a good outcome may mean the person lives an extra three months, or six, and has more quality time with his or her family. The median survival for patients with glioblastomas like Elaine’s is 18 months from diagnosis; Elaine exceeded that, but even more important, she had a really good quality of life almost the entire time. She didn’t experience significant decline until the last 1-2 weeks, and right up to that point she was living her life, absolutely convinced she was going to beat this wretched disease. She never talked about dying; she spoke of the future as if it were guaranteed. Ironically, I think part of the reason Elaine felt so optimistic — her optimism was utterly heartbreaking for those of us who knew what the outcome would be — was due to her condition. The tumor, the resections she had to remove first the initial tumor and then the first regrowth, and the medications affected her memory. So invariably she would not recall anything Dr. P. and the nurses told her at her previous appointment. I suppose short-term memory loss is both the blessing and the curse of brain tumors. The forgetfulness is probably harder on the family than the patient. I’m not proud of the fact that I sometimes grew frustrated at having to repeat information multiple times, such as reminding Elaine that she would never be able to drive again, or at hearing her repeat certain things over and over because she didn’t remember she’d said them. The issue of driving was a constant sticking point. For a vibrant, active person to be told she can’t drive anymore is a huge blow. Twice in my life I’ve had to watch someone I love grapple with that painful loss of independence — first my mother, who died in 2000 after a long battle with multiple sclerosis and a shorter battle with breast cancer, and now Elaine. They were both justifiably pissed off about it, but unlike my Mom, Elaine would frequently forget being told she’d never be behind the wheel again. That’s one of the challenges of brain cancer that you don’t really understand until you have to deal with it personally. I won’t go into the specific details of Elaine’s tumor or why the gold standard treatment for glioblastoma had zero effect on her tumor, but because her type of tumor was known to not respond to standard chemo, the clinical trial was her only hope. Translation: If the trial drug regimen stopped working, Elaine would die, and relatively soon because of the aggressive nature of the tumor. Fortunately, the drugs did work temporarily. For more than a year, Elaine was able to go to movies, plays and operas, host the holidays, lunch with friends, go to parties and attend her grandchildren’s events, even if she had to be driven everywhere. She joked about buying a bicycle to get around, or perhaps a unicycle. But in the end, she just relied on family and friends to chauffer her wherever she needed to go. We tried to keep things as normal as possible, because that’s the way she wanted it: She didn’t want to focus on being sick. In fact, if you asked her how she felt, which people invariably did, she would always say: “I feel fine. Really!” And the thing is, she did feel fine. 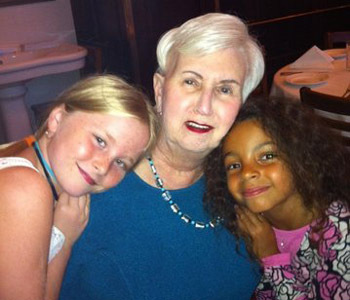 As much as the tumor affected her memory and, sometimes, her moods, physically she was healthy and felt strong. It was a blessing that, unlike many cancer patients, she experienced very few side effects from the chemotherapy. When you brace yourself for bad news, theoretically it shouldn’t come as a shock. But there’s no way to truly prepare for the worst-case scenario. In mid-December, we sat in Dr. P.’s office and looked at the latest MRI. The tumor had grown significantly since the previous MRI six weeks earlier. There was nothing left to try. As we absorbed the blow, Dr. Paleologos spoke to us about hospice and palliative care. Elaine sat and listened attentively, holding my Dad’s hand, and when the doctor was finished talking, she said very quietly: “What about getting better?” Dr. Paleologos looked her in the eye and very gently said she was so sorry, but at this point Elaine wasn’t going to get any better. It wasn’t the first time she’d said those words, but I think it’s the first time Elaine fully understood. Over the next several weeks, she slept more and more and ate less and less, and finally she lapsed into a coma. She died on January 2, 2012, at home, in her bed, with her entire family around her. We didn’t get our miracle, or the happy ending we wanted, but I’ll always be grateful to Dr. Paleologos for giving Elaine that extra time — and with it, the memories, experiences, hugs and kisses, phone conversations, shopping trips and family holidays we wouldn’t otherwise have had. Judy Germany is a senior writer-editor at Rush University Medical Center. This entry was posted in Cancer, Neurology and tagged brain cancer, brain tumor, neuro-oncologist, Nina Paleologos. Bookmark the permalink.